✔ how to become a certified bookkeeper in Canada and the U.S.
Are you searching for where to find online bookkeeping courses ... and bookkeeping training? This website, Bookkeeping-Essentials, offers free online bookkeeping training. The training is presented as a series of casual chats geared to small business owners working from a home office. ... but what if you need more bookkeeping training than I offer here? In this chat I explore online bookkeeping courses that appeal to me. I've decided to use a question and answer format ... so warm up your cup of tea and let's take a look. FYI, some of the bookkeeping courses I found were not actually online ... but you sign up online ... and the bookkeeping course material is mailed to you ... and consists of CDs and/or binder with course notes. Q: What online bookkeeping courses should you take as a business owner to learn more about bookkeeping and what it means for your business? A: If you are a new business owner, CRA puts on live seminars in communities throughout Canada (although they are now pushing their videos and reducing the number of live seminars) and offers online webinars on an ongoing basis ... all for free. The webinars have been archived for viewing at any time; just search for Small Business Information Webinars or look under Events and Seminars> Small Business Information Sessions> Webinars. If you only have a dial-up internet connection, CRA says their webinars will still work for you. Go to http://www.cra-arc.gc.ca/vnts/menu-eng.html for more information. 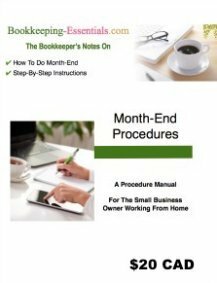 My site offers free training for the home-based bookkeeping owner who does their own books. In developing this site, I have tried to keep it casual ... but full of practical tips to help with your everyday bookkeeping dilemmas. So it assumes you know a little bit about bookkeeping. - what expenses have limitations. a community bookkeeping forum where you can ask your bookkeeping questions in a friendly, supportive environment. You may find that you need more formal bookkeeping training than what CRA offers ... or my site provides. Here is an affordable solution ... in terms of your time AND your money. This 20 hour course lets you integrate what you have learned with hands on practice sessions and a management analysis session. Read my review of both online bookkeeping courses ... or go directly to the website to view more details. Both courses are afforable. If, upon completion of either course, you are not fully satisfied, John's site says your tuition fee is 100% refundable. When you make your purchase through this site, Lakeshore Bookkeeping earns a portion of that sale. I realize making your purchase this way adds an additional step to the purchasing process ... but your efforts help me to continue publishing free articles to you. If you go directly to the sight (instead of clicking a link from here) to make your purchase, Lakeshore Bookkeeping does NOT earn a commission. Hidden Profit Prophet (formerly Best Small Biz Help) now longer offers this excellent, affordable online bookkeeping course. Small business owners who wanted to learn the numbers side of their business used to be able take a look at The Solopreneur's Lifeline video series on basic accounting: understanding financial statements. The videos were a series of micro courses in a condensed curriculum ... perfect for the busy entrepreneur. You could learn what you needed to know about your financial statements to help you build a profitable business long term. Each video was under 10 minutes. The introductory videos were free ... but you had to enroll and pay a 30 day access subscription fee to view most of the videos. This enabled you to learn at your own pace ... when you had time. There was no formal return policy. The series did not include setting up the books, how to make entries, etc. ... but it did help you answer the question, "Are you making any money?". Dawn has since added some blogs that talk about actual bookkeeping as opposed to how to read your financial statements. Dawn Fotopulos, the founder of Best Small Biz Help says "the [course] content is worth hundreds of dollars if they had to take these courses elsewhere". I only viewed the introductory videos at the time I wrote this. Dawn Fotopulos is an engaging speaker so I'm sad to say that this series does not seem to be available on her site anymore. Instead her new site promotes the books she has authored over the past few years. While exchanging e-mails with Dawn in 2010, she let me know that "we just got named as one of the top ten small business websites by CommuniquePR out of Seattle. We're pretty excited about that ...". Bookkeeping-Essentials.com was listed as a small biz resource back in 2010. Dawn explained that "we don't list everyone, just for the record. Your niche is important and there are few people really doing the job as you are." 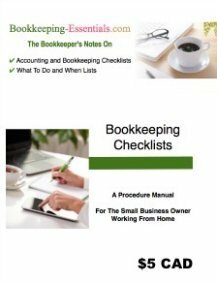 Find out a bit more about Best Small Biz Help in the U.S. section of "The Bookkeeping Resources". ... Cash management is presented each month that has a Thursday fall in the 5th week. You may find these online bookkeeping courses to be your cup of tea ... the price is certainly right! You must register but only the first 25 participants get to attend the live session. If you aren't one of the first 25 to sign in, you will still be able to view a recording of the session. I have attended three sessions so far ... two under bookkeeping employees ... and one under bookkeeping professionals. I did have some trouble getting the webcast recorded session to work initially. I find the audio is not great as the presenter's voice fades in and out ... but maybe it's just my computer. The live sessions worked fine with no problems. As the sessions are free, be prepared to hear information about the presenter's firm and services. The three series are a marketing tool meant to introduce you to their services and generate interest in their study program. Each session gives you a general executive overview of the topic. There is some repetition between sessions ... but if you are just learning the concepts, it assists in reinforcing what you heard in a previous session. Live sessions have Q&A at the end where the speaker takes time to speak with each attendee. You can find the online bookkeeping course curriculum(s) at www.smithyounguniversity.com > Training> Free Training. Principles of Accounting.com is not really an online bookkeeping course. It is a bit more formal and more like an online introductory accounting course. It is a free online textbook that covers financial and managerial accounting. It is very comprehensive and if you take the time to work through it, it would be similar to taking an accounting course at university. Each chapter has 3 study guides which tests for goal achievement ... fill in the blank ... multiple choice. There are also problems, checklists of key concepts and key terms. Some chapters have a link to preview the global edition. I'm guessing this would be the textbook revised to reflect IFRS instead of U.S. GAAP ... but I'm not sure as I couldn't find any notes as to what was different about this edition. Each chapter has a video you can play to hear a free lecture on the topic by the author Larry Walther, Ph.D., CPA, CMA. You can also download and print the pdf files for your own individual use ... so you can work away from the computer. WOW is all I have to say!!! Q: What resources are available to study for a bookkeeping certification exam or to improve your bookkeeping training? A: If you are a studying to take your bookkeeping certification, I found two sources that may help you achieve your goal. Both of these sites have online bookkeeping courses and/or training. I like both of them because they have fun quizzes and great practice exams you can take to self-test your knowledge. Taking them helped me determine where my bookkeeping training weaknesses were ... so I could devote more study time to those areas. The other thing I like about these online bookkeeping courses, is that I can study at my leisure from home. Dave Marshall's website, The Bean Counter uses interactive tests and games to keep the learning fun and light hearted. This U.S. website even offers a tutorial on Basic Canadian Payroll. Click here to go directly to The Bean Counter website. Please do NOT take these as recommended or endorsed study material by any association or educational facility. They are simply some of the online bookkeeping resources I found that I used to study for the Certified Professional Bookkeeper exam (I got 90%) ... and they are my recommendations for basic, informal, affordable bookkeeping and accounting training. For more formal training materials, see the bookkeeping certification resource information that is coming up next. I am a compensated affiliate and earn a commission if you purchase any of these products through The Online Bookkeeping Shoppe. Purchasing these products through my website helps support this site and enables me to publish free articles for your business. That makes it a WIN-WIN-WIN for you, me, and them. Q: What Canadian online bookkeeping courses could you take to improve your bookkeeping training ... and have fun doing it? ﻿A: The bookkeeping industry in Canada is not regulated at this time. Therefore, I have gathered the following information about programs that help to professionalize and increase the quality of bookkeeping in Canada. While many colleges throughout Canada have bookkeeping diploma programs ... some of which have online bookkeeping course offerings ... I will not be discussing them here. In my opinion, this online bookkeeping program differs from college based programs in that graduates must meet continuing professional development to maintain their licence. Most college programs have no further requirements upon completion of their program. Canadian Institute of Bookkeeping (CIB) program is similar to obtaining a college diploma in that it is an academic program partnered with Canadian Community Colleges ... not an association ... and may or may not include online bookkeeping courses. The diploma results in a CB for certified bookkeeper.This program does NOT meet my definition of certification even though it leads to an excellent and worthwhile college degree because it does not appear to require ongoing professional development requirements, dues and membership monitoring. To understand the difference between obtaining a degree/diploma as opposed to a professional certification, think about other professions. Someone does not automatically become a professional engineer just because they have a degree in engineering. Lawyers who obtain a law degree can't practice law until they are accepted into the bar association. Accountants do not become certified just because they majored in accounting at university. Bookkeepers are NOT certified just because they completed a bookkeeping program through local community colleges. The Canadian Payroll Association (CPA) offers a certification program. You can choose between the Payroll Compliance Practitioner (PCP) or the Certified Payroll Manager (CPM). They also offer web seminars. This online training provides easy access to continuing your professional education. The CPA has been representing employers’ payroll interests since 1978, through its mission of payroll leadership through advocacy and education and its values of community, professionalism and authoritative knowledge. Q: What Canadian online bookkeeping courses could you take to improve your bookkeeping training? A: I put together some information for both Canadian and US bookkeeping certification associations. Also, AIPB has finally come into the 21st century. They now offer AIPB course as e-books. See bookstore.aipb.org for more information. GAAP for small privately owned businesses is very similar. The AIPB courses would be very useful training and provide you with excellent reference guides going forward. The best part is they are AFFORDABLE. Courses are priced in the $29 to $69 USD range; pricing is usually $10 less if you are an AIPB member. In recent years, they've also added some tax courses ... which is awesome.